One of the best ways to figure out your next home improvement project is to consider your current home. What about your current home frustrates you or doesn’t feel right? Taking some time to consider the pain points of your current home will give you some valuable guidance for home improvement projects that will make a big difference. A home improvement project that helps resolve current problems or frustrations ensures the investment is one you will enjoy for years to come. For example, if your current kitchen makes meal prep difficult and frustrating, it may make sense to make kitchen remodeling your next home improvement project. A new kitchen that is better designed and equipped for your needs can take meal prep from a frustrating chore to a much more enjoyable task. If you find that your current home is lacking space, finishing the basement or investing in a home addition can help increase the livable square footage and give you more usable space. Whether you know what you want to do next or not, getting some visual inspiration can help you decide on a project and narrow down options. Take a drive through your neighborhood and a few others to take a glance at other homes. This will give you plenty of different homes to look at and inspire you as you compare them to your own home. 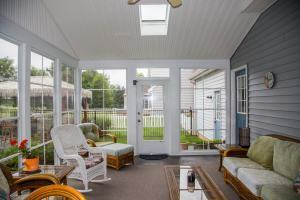 You may discover that new siding, a new front door, or a sunroom addition could be the perfect home improvement project for your home. Just like driving around to look at homes gives you some visuals to inspire you, doing some research can do the same. By searching online, visiting home shows, and looking at magazines, you can get a good idea of what’s possible in home improvement and what’s popular for current design trends. Even if some of what you find isn’t right for you, you’re bound to find some good ideas that will inspire projects for your current home. Plus, many home improvement contractors feature their work on their website, so you can see real-life home improvement examples from the comfort of your own home. Looking at images online and then looking around your home may help you decide on the project you want to tackle next. Another great way to gain some inspiration for your next home improvement project is to visit a showroom. You’ll be able to see examples of materials and projects in person and be inspired on the spot. This will give you the chance to see and touch the products for your next project. Plus, there are experts available to answer any questions you have or show you the variations available for what you see featured in the showroom. With over 60 years of home improvement experience serving Lancaster County, Zephyr Thomas is ready to help with any home improvement need. Call us at 717-399-4708 to get a free quote on your next home improvement project or stop by our showroom to get inspired!